The Canaries had trailed when Reece James calmly scored from the penalty spot just prior to half-time after Ben Godfrey had controversially been adjudged to have handled Sam Morsy's shot. 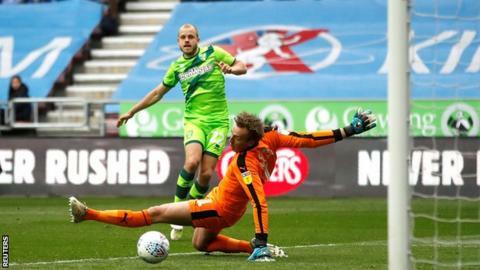 But Pukki rescued a draw for the Canaries when he latched on to Kenny McLean's pass and calmly slid the ball past Wigan keeper Christian Walton. Wigan thought they had snatched a winner deep into stoppage time but on-loan Sheffield United striker Leon Clarke's header was ruled out for offside. A point was the least Paul Cook's Latics deserved after a spirited display which tested Norwich's resilience. Backed by more than 5,000 travelling fans, the Canaries created the game's first opening when Pukki was denied by Danny Fox's goal-saving block, while the Finland striker also failed to connect with Marco Stiepermann's cross from close range. But Norwich keeper Tim Krul had to save well from Lee Evans' header before he was beaten by James' penalty. That decision was tough on defender Godfrey, with replays suggesting that Morsy's shot ricocheted off his thigh and on to his arm from only a couple of yards away. Wigan went close to a second when James fired just over from 25 yards and Krul tipped Clarke's clipped effort around the post. "I thought we did enough to win. The penalty was a big decision that went in our favour but there is a general feeling that the last goal (Leon Clarke's disallowed effort) looks onside. "We've gone up against a very good side, we've taken the game to them, we've pressed them and I thought we were unlucky not to see the game out. "To be eight games unbeaten at home in this league, there are some good things about what we do. Unfortunately, our away form is the Achilles heel and that must change at Leeds." "It's a good point. If someone had told me before that game that we would be facing a strong home side and still be seven points clear of third, we would have definitely taken it. "Wigan at home are a real threat and I was pleased with the late equaliser and that we went close to winning the game." On the penalty: "It was a strike from about two yards away. He [Ben Godfrey] tried to block the shot and it hit his leg and went on to his hand. There are some crucial decisions going against us and it's remarkable we've come away without losing a game."